The protests at Standing Rock over the Dakota Access Pipeline have resulted in a victory for the Sioux, as NBC News reports the Army Corps Of Engineers has turned down Energy Transfer Partners’ permit for construction through sovereign lands. 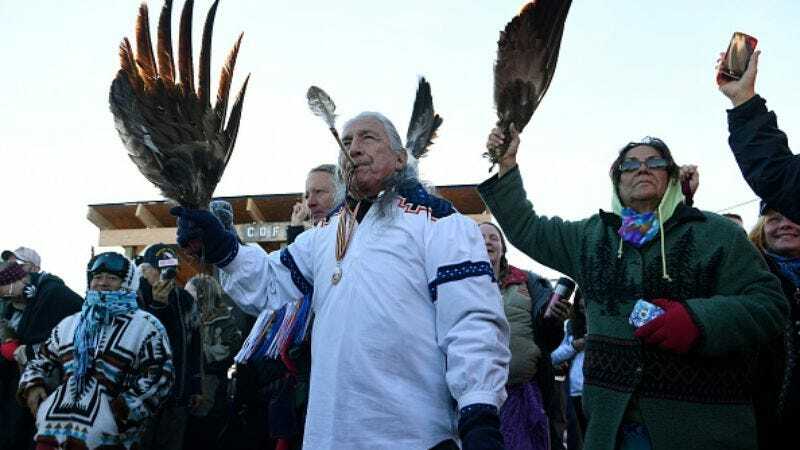 Though the protests only began to garner national attention this year, the Sioux and other native tribes made their opposition known when the reroute through tribal lands was first proposed in 2014. Standing Rock’s plight was met with rubber bullets and macings on site, but also donations and many other displays of support around the country, and protestors are currently celebrating the victory. Applauding them from afar are actors and artists like Adam Beach, Leonardo DiCaprio, Chance The Rapper, Alicia Keys, Mark Ruffalo, Katy Perry, Ava Duvernay, and Michael Moore, as well as progressive politicians like Bernie Sanders. Shailene Woodley, who was arrested while protesting at Standing Rock, is probably feeling pretty good about this, too. We hear you, Mark Ruffalo, this may not be a permanent victory as Energy Transfer Partners and the Army Corps Of Engineers figure out where exactly to reroute the thing. And it’s still entirely possible that President-elect Donald Trump will find a way to jam the damn thing through when he takes office next year. But we’ll still take a moment to acknowledge one of the rare highlights in an otherwise terrible year.